I know the first question on your mind and the answer is no, this movie has nothing to do with the coffee chain Starbucks on the female viper pilot on Battlestar Galactica. Starbuck is a Canadian film released in 2010 and is being released in the US to limited theaters this year. There is word that there will also be a US remake of this film starring Vince Vaughn down the line. However, I'm not a big fan of remakes, but the original is a film that you should definitely see. 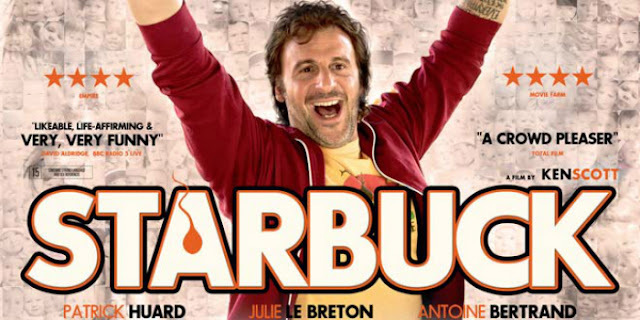 Starbuck is about a man that has a bit of a reputation that is rightly deserved as being incompetent and not dependable. In his youth he becomes a sperm donor to raise money for reasons you'll learn later in the movie. The clinic he finds out many years later uses his sperm to the total of 533 times successfully leading to a lawsuit by a number of his children seeking to find out his identity. In the mean time his girlfriend is pregnant and thugs are looking to drown him for his debt of $80,000. Sounds off the wall and hilarious? That's because it is. The lead role is played by actor Patrick Huard who does a wonderful job in his transformation from someone you wouldn't care for to someone that will move your heart. All of the actors and actresses in the film does a great job, and the lines are hilarious. The film is in French, but for the most part the subtitles are easily read. That's always a concern with me as far as Foreign films at the movie theater. To make a comparison, I would say that this film is the French Canadian variant of Silver Lining Playbook. I really enjoyed Silver Lining Playbook and thought they were worthy of all the awards they won. Starbuck is just as quirky and full of humor as well. Go see it in theaters beginning March 22nd, you won't be disappointed! What would you do if you found out you fathered 533 kids?